When space is at a premium, a conventional full-swing door can be a real inconvenience. With a sliding pocket door, you’ll save space and give your room a more streamlined look. These doors are mounted on tracks and roll in and out of a “pocket,” or hollow compartment in the wall, so they don’t take up space in the room. They’re not the most reliable doors around, though, and the noise some models make can be an annoyance. Pocket doors are best known as space-savers, but they also bring an element of minimalist style to a room. 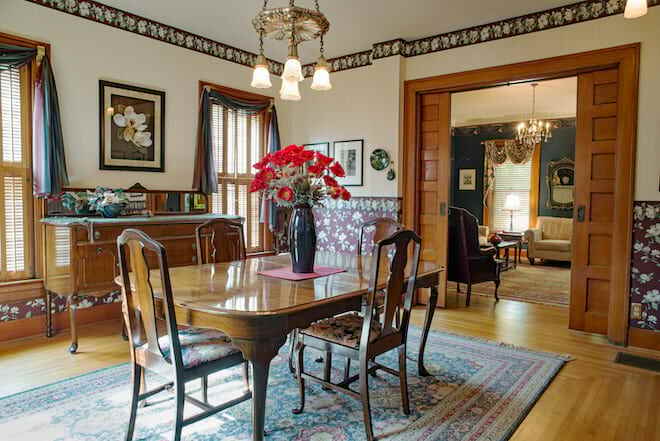 In turn-of-the century homes, they’re a convenient and authentic feature. The average full-swing door opens to a radius of between 2 1/2 to 3 feet. To use the door, you’ll need to keep around 10 sq. ft. of space free. In a small bathroom, laundry room or closet, that can be a considerable loss of space that could be used for something else. A pocket door gives you that space back. You’ll have room to arrange cabinets, seating, and other furniture exactly how you want them. A frosted glass pocket door is perfect for a small bathroom because it not only saves spaces but also lets in light. Pocket doors are perfect for connecting two spaces you might want to join without a door getting in the way. By installing one between the living room and the family room or the kitchen and the dining room, you can open up the space for parties or keep the door closed for more intimate gatherings. If your home has two guest bedrooms, installing a pocket door between them lets you offer your guests a choice of separate rooms or a two-bedroom suite. Want to set up a home office off the living room? A pocket door lets you separate the space when you want privacy or open it up without cutting into the living room. An open interior door breaks up the line of the wall and can look a little clunky. Pocket doors disappear completely when open, creating an elegant, streamlined look that works especially well with Japanese- and Scandinavian-inspired interiors. Their disappearing act makes pocket doors good places to experiment with daring colors and design elements. Paint the living room door lime green, and if you decide you don’t like it, you can push it out of sight until you have time to repaint. Pocket doors were fashionable in the late 1800s and enjoyed a short period of revival in the 1950s. They fell out of popularity not for stylistic reasons, but because older models used raised tracks on the threshold, posing a tripping hazard. To avoid this problem, today’s pocket doors use ceiling tracks or recessed floor tracks. 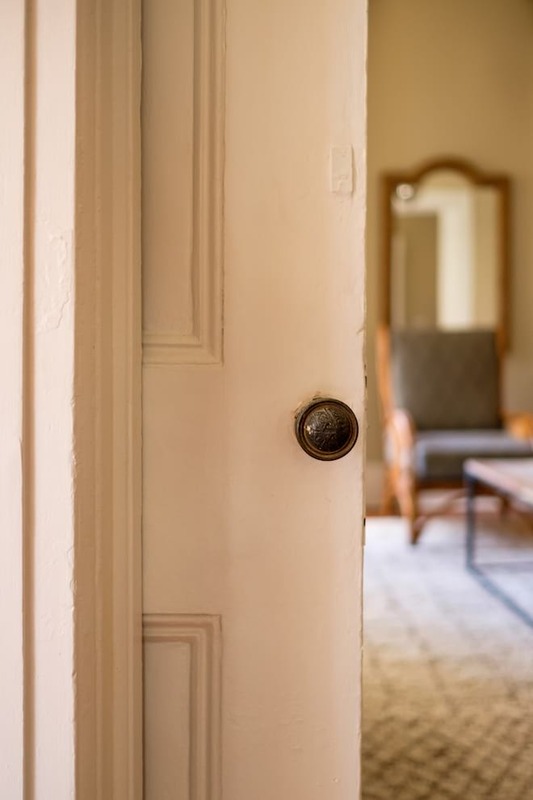 In a Victorian-era or mid-century home, modern pocket doors lend an authentic feel without the danger. Notoriously temperamental, pocket doors are more likely to malfunction than conventional doors, and when they do, they’re harder to repair. These doors require precision installation to operate correctly, so they’re not great DIY projects. Closed pocket doors don’t always form a tight seal, so light, noise, and odors travel through them more easily than through a conventional door. They can let odors and steam escape from the bathroom and fail to keep household noises out of your home office. A conventional door can be swung open or closed silently. A pocket door, no matter how carefully you roll it, will make some noise as it moves along the tracks. Aluminum tracks with nylon rollers minimize the noise, but don’t eliminate it. If you’re a light sleeper, think twice before installing a pocket door anywhere near your bedroom. Pocket doors have a bad habit of developing problems that make them hard to use. They can start to stick, screech or fall off their tracks entirely and become next to impossible to use until repaired. This is even more likely if you have young kids who might be rough on the door. Regular cleaning and, depending on the door type, lubricating with silicone spray, reduces the risk of problems. Conventional doors, however, can work flawlessly for decades with only occasional oiling. Someone with limited grip strength or dexterity in their hands, such as a person with arthritis, is likely to have more trouble with a pocket door. Adding a bar pull or mortise pull can make the door easier to use. For wheelchair users, on the other hand, a pocket door that slides smoothly is easier to open, close, and maneuver around than a conventional door. If the pocket door starts to stick, however, it becomes a real hassle. A pocket door requires a sturdy wall that’s a little over twice as wide as the door itself. A 36-inch pocket door needs a wall that’s at least 74 inches wide. If the wall contains wires, pipes, heating ducts or other utility lines, these should be relocated. If it’s a load-bearing wall, extra support should be added. Installing a pocket door is a challenge even for experienced carpenters. The slightest error in installing the frame or track means the door won’t roll smoothly. If the frame becomes damaged or something falls into the track, repairs will take some effort. That could mean tearing out part of the wall to access the track. Space-saving, streamlined, and versatile, pocket doors help you make more efficient use of your rooms and open up new decor options. They’re well suited to both historical architecture and modern minimalist aesthetics. If you decide to install one, though, consider having a professional do the work to avoid ending up with a finicky door. Even when it’s lush and green, an uneven lawn makes sunbathing and games less enjoyable and makes mowing hard work that leaves ugly bald patches. Drainage problems are also more likely, putting your lawn at risk for disease and your foundation at risk for damage. Nearly every lawn develops lumps and bumps eventually, but regardless of the cause, it’s almost always possible to straighten things out. Knowing why your lawn has developed uneven areas helps you decide how to go about leveling them out. 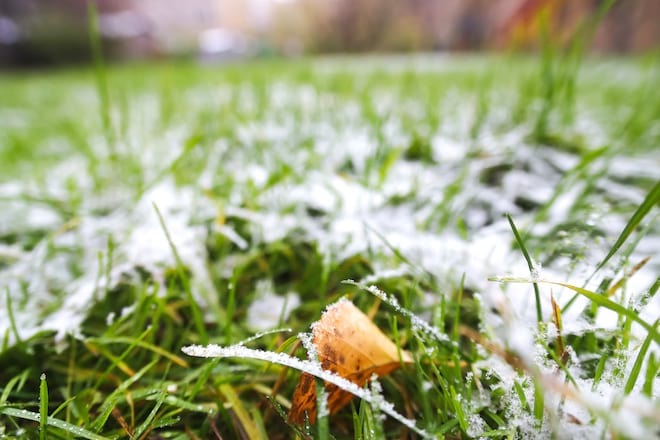 Ground settling during the seasonal freeze and thaw cycle is one of the most common causes of bumps in a lawn. Buried objects, such as logs or construction debris, can leave pits as they settle and decay. Diseased grass can cause the lawn to sink in places. A damaged sprinkler system or leaking pipe can cause underground erosion. It’s usually possible to correct uneven areas like these with minimal damage to your existing grass. 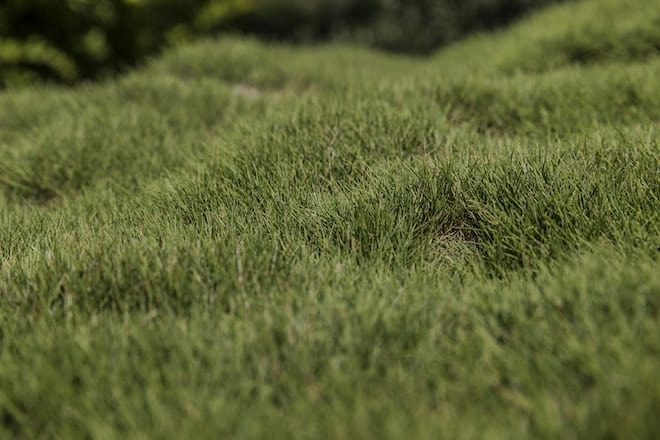 For hills or slopes, however, you might need to regrade the entire lawn. If the dents in your lawn are less than 1 inch deep, top dressing is a simple way to even them out. The best top dressing for your lawn depends on your soil type. For sandy or loam soils, use a gritty top dressing such as coarse sand or a mixture of coarse sand, peat or compost, and topsoil. 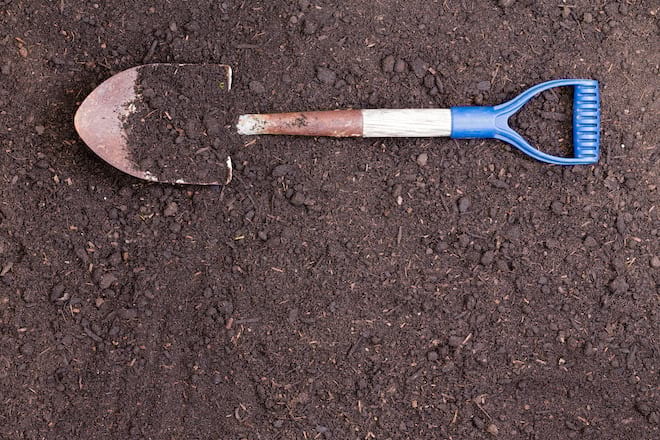 For clay soils, use a mixture of compost and topsoil. Spring and early fall are the best times to do the job because your grass will have plenty of time to grow through the top dressing. First, prepare your lawn by mowing it with the mower blade at the lowest setting. Dethatch the lawn with a dethatcher or a rake. If the lawn hasn’t been aerated in the last three years, aerate it with a spike aerator or aerating machine. With a shovel or trowel, apply the top dressing to the lowest point of the depressions in the lawn. Add no more than 1/2 inch of top dressing to avoid burying the grass. Rake the top dressing to even it out over the soil, then use a push broom to work it in further and uncover the grass. Finish by watering the grass to settle the top dressing. Alternatively, you can fill the depression with soil and reseed the area. For depressions of between 1 to 24 inches deep, resodding is the most practical approach. This requires cutting out the existing sod, addressing the cause of the sinking, then adding more stable soil. To remove the sod, water the grass and use a shovel or spade to cut 1-foot squares into the grass below root level. Gently pry up the squares of sod until the roots are released from the soil. If the grass is healthy, roll up the sod grass-side inward and place it in a cool, shady spot to keep it moist. 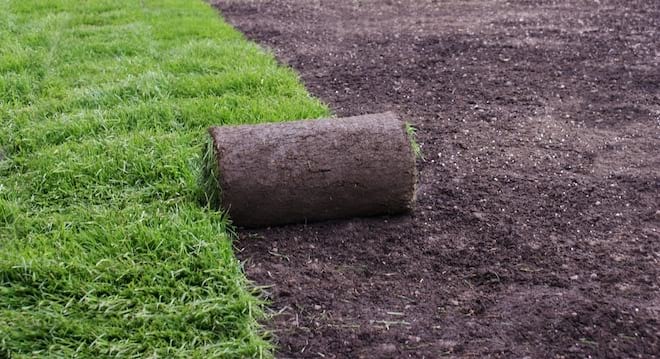 If the grass is in poor condition, you’ll need healthy sod or grass seed to replace it. Check for anything within the soil that might have caused the sinking, such as a rotten log or leaking sprinkler, and correct the problem. Fill the depression with topsoil and gently tamp it down. If the depression is more than 6 inches deep, fill in several inches at a time, tamping and watering the soil as you go to remove air pockets. The filled area should be around 1 inch higher than the surrounding lawn to allow for settling. Replace the sod or reseed the area, then water thoroughly. Sometimes spot-correcting just isn’t enough. If your lawn has large slopes or deep, wide pits, regrading the whole area is the only way to get an even surface. This will cover your existing grass, so you’ll need to resod or reseed. Creating a slope that ensures good drainage and easy mowing takes some planning. Your lawn should slope downward away from your house to prevent it from funneling water toward your foundation. A slope of around 6 inches every 10 feet is ideal, but anywhere between 2.5 to 12 inches every 10 feet is acceptable. If you’re unsure about calculating or creating an optimal slope, it’s worth hiring an experienced landscaper. This is especially true if you have a large lawn. A landscaper can bring in equipment, such as a site level and backhoe, to get the job done quickly and correctly. First, establish your lawn’s slope by calculating its run and rise. This tells you the difference in height from the high point near the foundation to the low point near the storm sewer or gutter. Place a stake at the highest and the lowest points of your lawn. Tie a rope between the stakes and hang line levels on the rope to ensure it’s perfectly level. Measure the full length of the rope to find your lawn’s run. Then go to the stake at the lowest point and measure the distance from the rope to the ground. This is the lawn’s rise. If the run is 100 feet long, there should be a rise of between 25 inches to 10 feet. If the current slope is too low or the lawn slopes toward the house, redistribute the soil to create a better grade and an even surface. 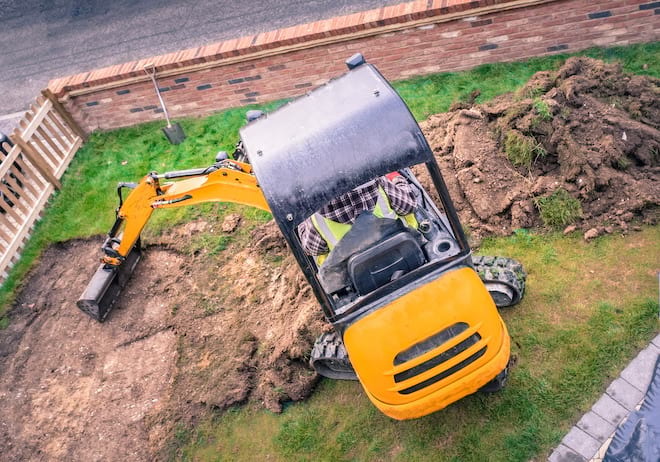 Before you start digging, locate any pipes, wires or other objects under your lawn to avoid damaging them. Start regrading by removing soil from the high spots in the lawn. To create the new grade, you can redistribute the topsoil you removed or add topsoil from another source. First, add 2 inches of topsoil near your foundation and till it into the existing soil to promote good drainage. Then add another 4 to 6 inches of soil, but leave 6 to 8 inches of your foundation visible. Gradually distribute soil until you have the slope you want, then use a landscaping rake to create an even surface. For a flawless finish, drag the edge of a two-by-four over the soil to smooth out any remaining bumps. When you’re satisfied, lay your sod or reseed the lawn. A level, correctly graded lawn is not only a lot more enjoyable to use, it’s also easier to maintain and protects your home from water damage. A few shallow low spots are easy enough to correct by top dressing or resodding, but if your lawn is hilly or poorly sloped, it will benefit from a full regrading. The sink is one of the most frequently used focal points in your kitchen, so the model you choose must be able to stand up to daily demands while still retaining its beauty. 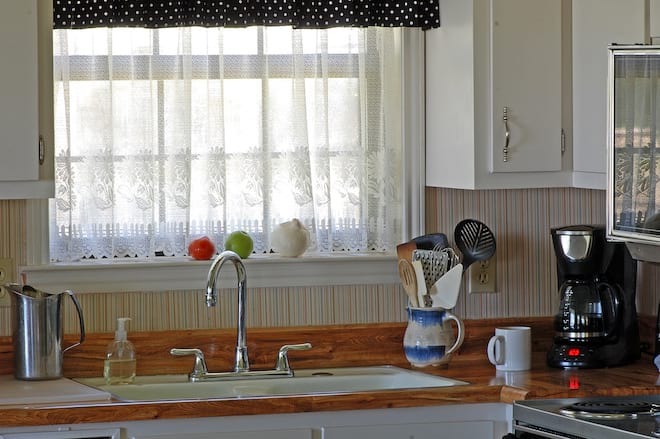 The design of your kitchen sink matters, but it’s the material the sink is made out of that has the greatest effect on how well it can meet your needs. Most kitchen sinks are double-basin models consisting of two, side-by-side bowls. If you have a small kitchen, however, consider installing a single-basin sink to save space. Beyond this, kitchen sinks are found in three basic designs. Top-mount sink – This style of sink is installed so that the top edge sits above the counter. A rim around the top of the sink holds the sink in place and creates a smooth, finished appearance. This is the most common sink style, partly because it’s the easiest to install. Undermount sink – An undermount sink is set below the counter and has no top rim. The edge of the counter extends to the top of the sink basin, saving a bit of counter space. Because it requires support such as stands or braces underneath it, this design is more complicated to install than a top-mount sink. 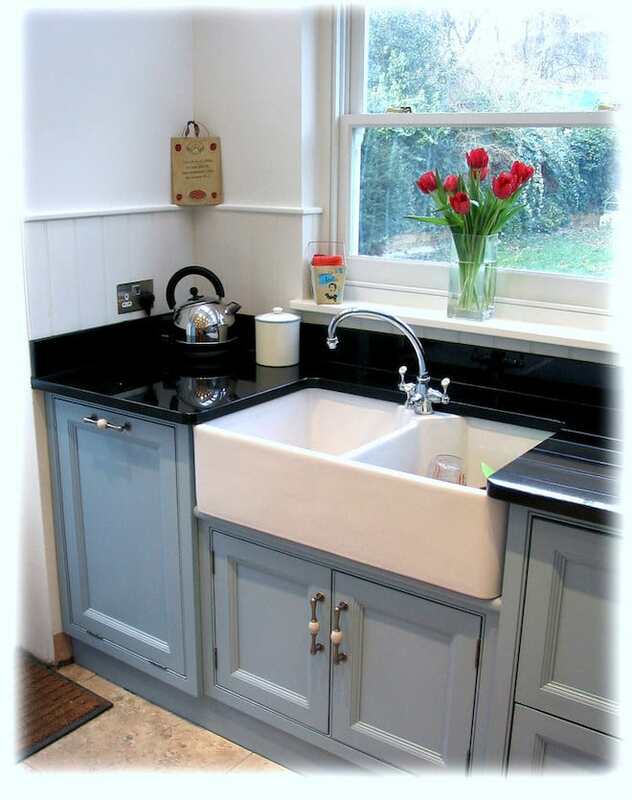 Farmhouse (apron) sink – These models have a front section that replaces part of the counter and cabinetry. Traditionally used in farmhouses, they’re built for efficiency and are lower and deeper than standard sinks. Once you’ve decided on the design that works best for you, take time to get to know the materials available. Each has pros and cons in terms of appearance, durability, ease of installation, and cost. Stainless steel is the classic kitchen sink material, and the one most restaurants choose thanks to its durability and ease of cleaning. 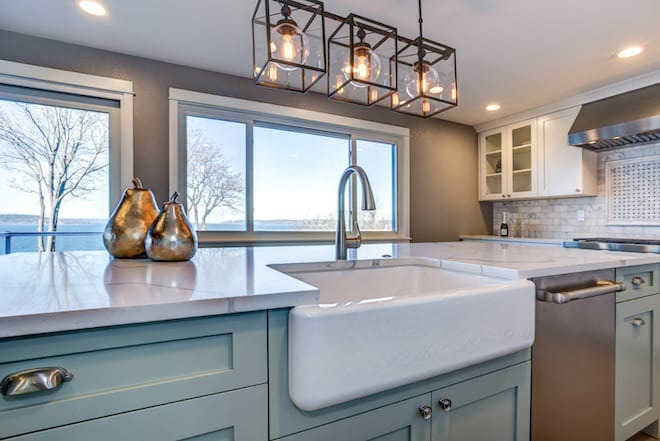 The gleam and clean lines of a stainless steel sink lends a contemporary feel to the kitchen and is a particularly good choice if you already have stainless steel appliances or counters. This inexpensive material is easy to keep clean with just a sponge and gentle cleanser or a fine-grade scouring pad when necessary. 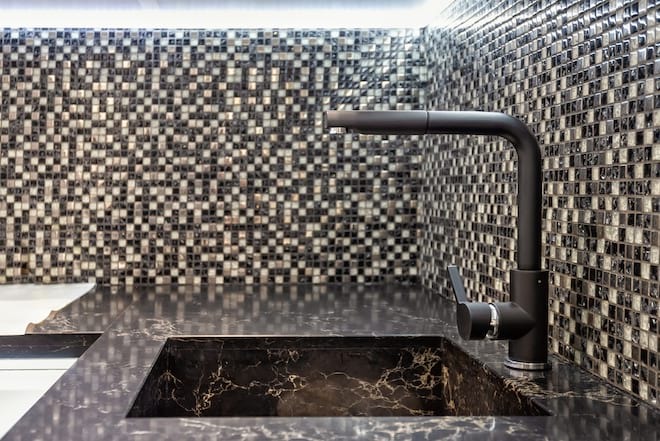 While stainless steel can suffer dents and scratches, these are only aesthetic flaws that don’t impair the sink’s functionality. If you’re not set on keeping your sink pristine, stainless steel is sturdy enough to stand up to years of use. Porcelain, sometimes called vitreous china, owes its popularity as a sink material largely to affordability and an unassuming appearance that fits into any decor scheme. Most porcelain sinks are designed with smooth, rounded corners, making them easier to clean. The material itself is somewhat less easy to clean than stainless steel, however. Porcelain tends to discolor with age, and once it does, it usually can’t be restored to its original color. Porcelain is somewhat fragile and prone to chipping and cracking. DIY kits are available to repair minor chips, but for damage beyond that, you’ll most likely need to replace the whole sink. This fact makes a porcelain sink less than ideal for the kitchen, where it may be subjected to dropped pans, knives, and other heavy or sharp objects. These sinks are made of cast iron coated with a layer of enamel to give them a smooth finish. This is the same material traditional cast iron cookware is made from. The vintage look of a cast iron sink has a rustic appeal that makes it well suited to farmhouse and other country-style kitchens. Cast iron won’t dent or crack, but the enamel finish can chip if hit by a heavy object and chips can develop rust. You’ll need to avoid scrubbing or using abrasive cleaners, which can wear away the enamel. Staining is also a risk so any food or drink likely to stain, such as wine or berry juice, should be wiped up quickly. Because these sinks are heavy, they typically need extra support. 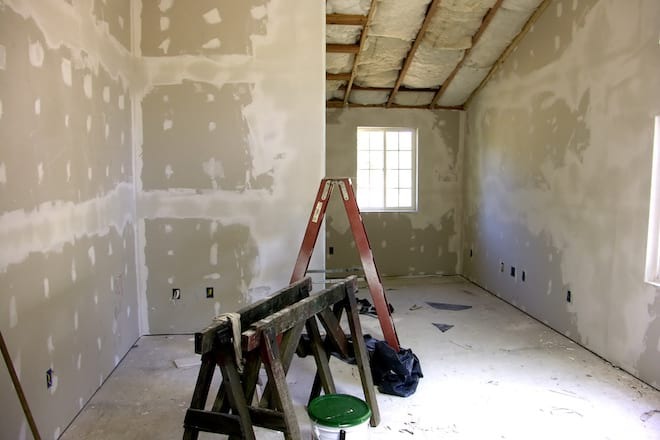 The additional labor required bumps up the cost of installation. Solid surface isn’t just for counter tops. Formerly known under the brand name Corian, solid surface is manufactured from a mixture of acrylic resin, powdered bauxite, and pigments. It’s one of the most versatile sink materials around. 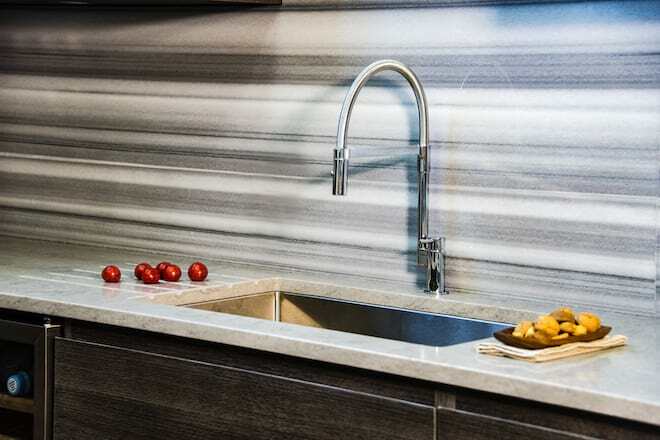 Solid surface sinks can be made in a wide variety of shapes, colors, and textures. If you love the look of natural stone, but the price is out of your budget, a solid surface sink provides a more affordable alternative. This material is also popular for creating straight edges and sleek shapes that give the sink an ultra-modern look. Solid surface is tough and unlikely to crack, and while it can sustain scratches under heavy use, these marks can be buffed out completely. The focal point of many traditional country kitchens, a copper sink is an investment in long-term durability and beauty. 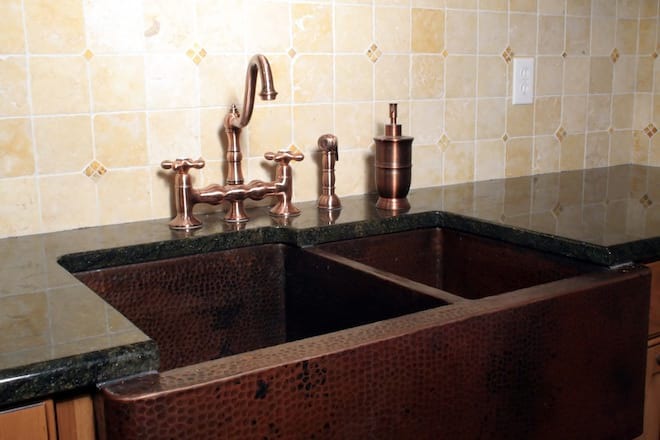 New copper sinks offer a bright gleam, but as they age, they take on a deep, rich patina. Like stainless steel, they don’t crack, but can collect dents and dings. Heavier gauge copper sinks are less prone to this. 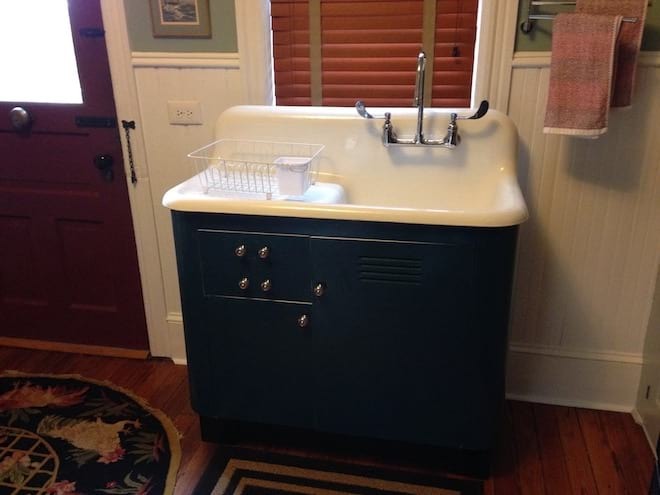 The character these sinks develop as they age gives them a warm, homey appeal. No two age the same, making them ideal for adding a unique touch to your kitchen. The natural antimicrobial properties of copper help keep your kitchen clean and healthy. Copper sinks clean up easily with mild soap. Acidic food and drink, such as orange juice and vinegar, can mar the patina, so you’ll need to wipe up spills quickly. To create a fireclay sink, clay is molded into shape, allowed to dry, then coated with porcelain enamel. As a result, these sinks are similar in appearance to enameled cast iron models and are typically available only in white and shades of off-white. They stand up well to heavy use, and resist scratches, stains, and chips. Neither acids nor bleach will harm them. They’re not impervious to damage, though, and need proper care to remain completely stain-free. Like enamel sinks, fireclay sinks are heavy and usually require additional support. 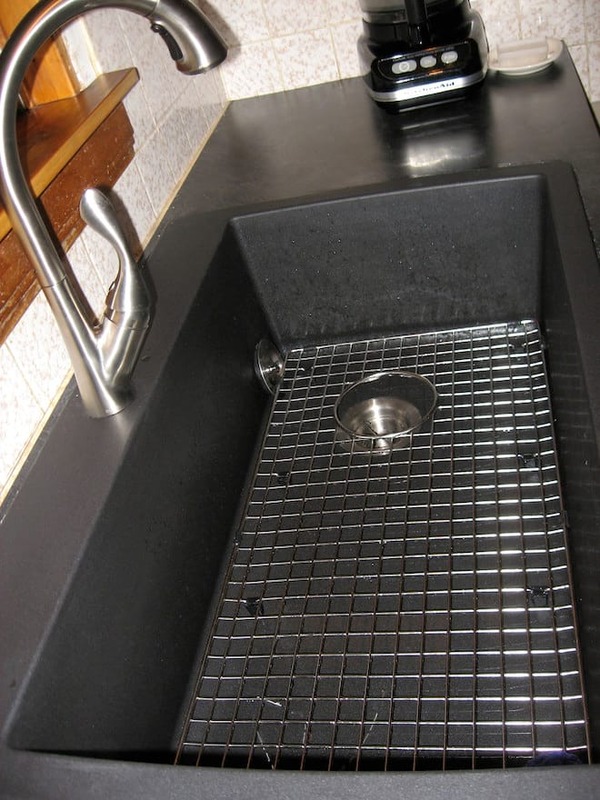 Composite stone sinks are made from ground stone held together with a resin binder. They’re most often made from granite or quartz. 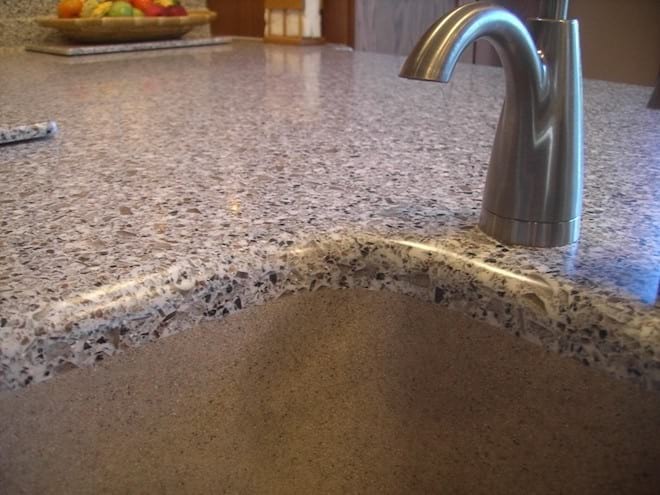 Granite composite is one of the most durable sink materials you can find, and is highly resistant to stains, chips, and heat damage. Quartz composite is somewhat less durable, but holds up well under normal use. These sinks are available in a variety of colors and patterns, and offer a more uniform appearance than natural stone. Slightly more expensive than stainless steel, composite sinks can give you the look of stone at a much lower price. 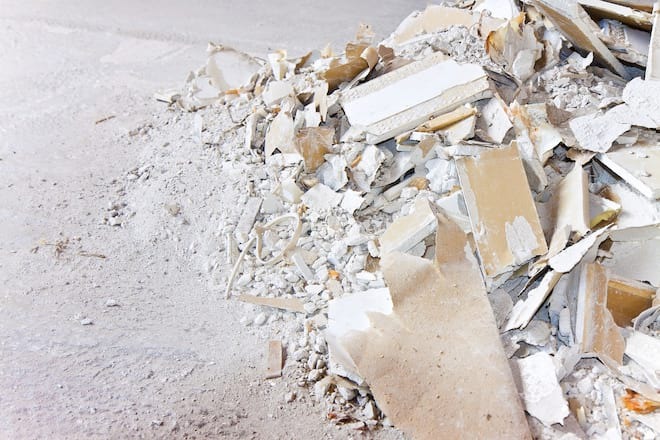 Composite sinks made with fiberglass or polyester are also available and, while relatively inexpensive, they’re also softer than composite stone and vulnerable to damage. If you’re in the market for a unique feature for your luxury kitchen, it’s hard to go wrong with a natural stone sink. Soapstone is currently one of the most popular options thanks to its exceptional resistance to stains and heat damage. It won’t etch, and any chips can be polished out. Solid granite is a more traditional choice for high-end kitchen sinks, but it has some downsides. This material is more delicate than soapstone, and can pick up stains and scratches. Applying a granite sealer helps prevent this, and minor stains can be removed with a specially formulated granite cleaner. Marble and limestone are also options, although both are susceptible to damage, and require proper sealing and gentle use. Most stone sinks should be treated with mineral oil every four to six weeks to seal the surface, which preserves its color and protects it from stains. Not surprisingly, stone sinks are exceptionally heavy with some weighing several hundred pounds, so they require additional support. If you’re looking for a tough, no-nonsense sink at a budget-friendly price, stainless steel, solid surface, and composite are excellent options. If getting just the right look is important to you, though, and you don’t mind paying a little more, consider enameled cast iron, copper or stone, depending on the qualities and appearance you prefer. The warm, dancing glow of a fire can turn even the dullest room into a cozy retreat. 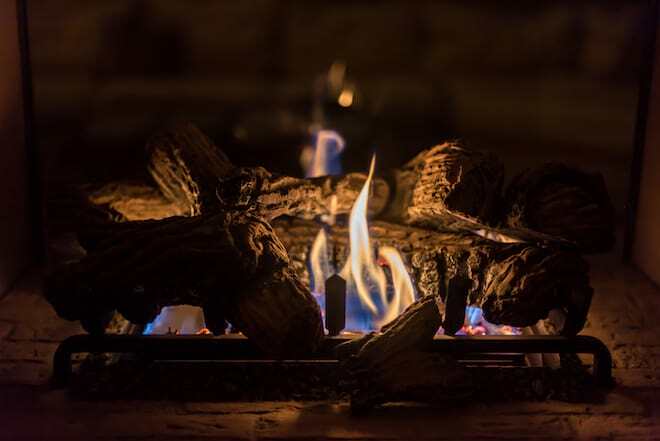 When a traditional wood-burning fireplace isn’t an option, gel fuel, electric, and gas log fireplaces offer convenient, affordable alternatives. They provide not only ambiance, but also supplemental heating and an attractive focal point. A relative newcomer to the market, the gel fuel fireplace has quickly gained popularity as an easy-to-use alternative to a wood-burning fireplace. These fireplaces use commercially produced cans of isopropyl alcohol gel to fuel a flame. To start a fire, open the can and remove the label, place the can behind the concrete log inside the fireplace, and light the fuel using a long match or a wand lighter. For a larger fire, you can use up to three fuel cans. Because the fuel burns so cleanly without creating smoke, soot or ashes, the fireplace doesn’t need venting. Each can burns for around two to three hours and produces enough heat to bring a mild warmth to a small room. It can’t compare to the heat from a roaring wood fire, but it will take the chill out of the room. You can either let the fire burn down to the bottom of the can or put out the flame by sliding the lid back in place or using a snuff tool. A gel fireplace’s flame is similar to the flame of a wood fire, with yellow, orange, and red tones and a soft crackling sound. To install the fireplace, just place it against a wall. 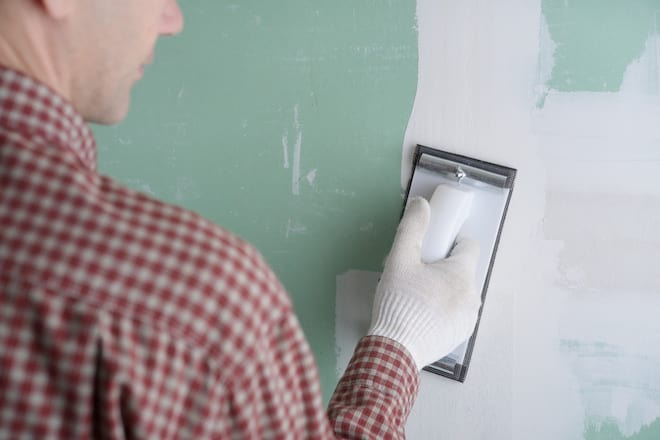 The only maintenance it needs is an occasional light cleaning, which is less than what a wood-burning fireplace or even a gas fireplace requires. You won’t be able to regulate the flame size as you would with a wood-burning, gas or electric model. If you put out the fire, the flame might not be as robust the next time you light the fuel can. While a gel fuel fireplace can give you mild supplemental heating, it can’t keep a room comfortably warm on a cold day. The biggest downside is the potential safety risk. You’ll need to take care not to spill the fuel anywhere. Spills can cause the flame to spread outside the fireplace. Once a gel-fueled fire spreads, it’s difficult to put out by smothering or dousing with water. If you decide to install a gel fireplace, keep an ABC- or BC-rated fire extinguisher nearby. Today’s electric fireplaces can create remarkably realistic flames that give you all the warmth and ambiance of a wood fire without the hassle. These fireplaces draw in air, pass it over a heating coil, then gently push the warm air back into your room. Some also use infrared heating elements to provide radiant heat that directly warms people and furniture. Because they don’t burn fuel, they don’t need venting. Electric fireplaces are available in a range of heating capacities, rated in Btus, and how much space they can heat adequately depends on their size. Smaller models that plug into a wall outlet are usually meant to heat rooms of between 400 to 500 sq. feet. More powerful models for larger spaces are available, but these typically need to be hardwired into the house’s electrical system by a professional. Electric fireplaces offer variable flame control that lets you choose the size of fire you want. The heating coil and flame effect can be controlled separately so you can enjoy a romantic fire on a warm summer night without overheating your house. Some models produce a crackling sound, but for those that don’t, you can find accessories that will add the sound. Electric fireplaces are the safest option of all, with no risk of spilled fuel or gas leaks. An electric fireplace won’t do you any good during a power outage. These fireplaces require a lot of power, so if you choose a plug-in model, be careful where you put it. Plug it into a circuit that’s already loaded with appliances and you’re likely to trip the breaker. They’re also not much more energy efficient than space heaters, so unless you enjoy high electric bills, it’s best to use the fireplace for supplemental heat over short periods. Gas log fireplaces offer a reasonably energy-efficient way to provide a room with warmth and an inviting glow. These fireplaces burn either natural gas or liquid propane. Natural gas models are hooked up to the house’s gas lines and require professional installation. Most propane models are hooked up to your home’s existing propane tank, which you can do yourself if you’re familiar with the process of installing a new propane-fueled appliance. If your home doesn’t have a propane tank, you can have a small one installed outdoors specifically for the fireplace. Liquid propane burns hotter than natural gas, so you’ll enjoy more intense heat from your fire. Both vented and ventless models are available. The safest choice is a direct-vent model, which draws in outdoor air to feed the fire and vents combustion gases and water vapor outdoors. 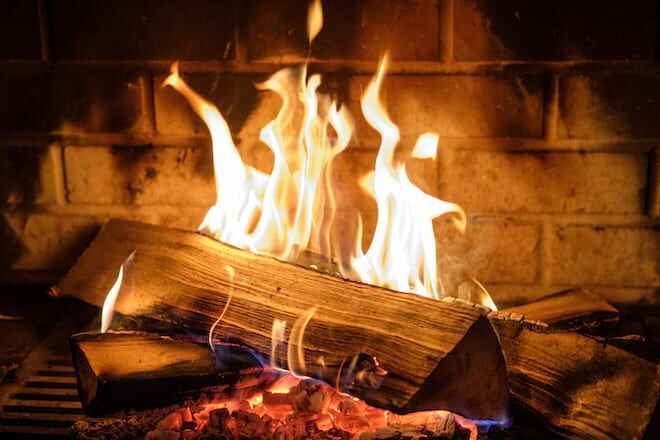 If you’re replacing a wood-burning fireplace, you can vent your gas log fireplace through your existing chimney. 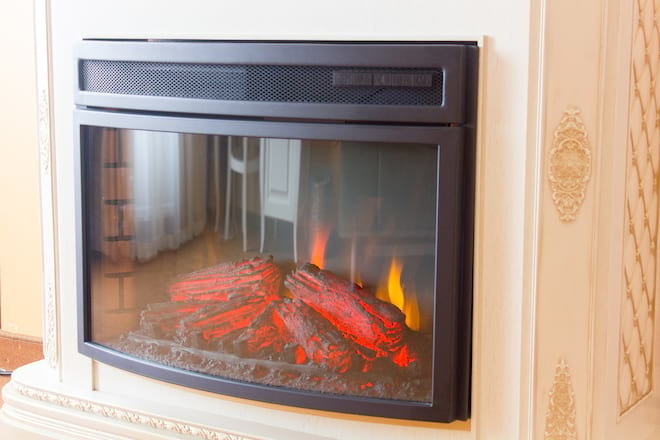 Ventless models are more energy efficient because they don’t lose heat through the chimney. On the downside, they leave combustion gases and moisture lingering in your home. Although generally considered safe, they’re still banned in some states. These fireplaces use a pilot light, and when that’s on, you can start a fire with the flip of a switch. The only maintenance you’ll need to do yourself is periodically taking the artificial logs outside and brushing them to remove soot. Besides this, the fireplace also requires an annual professional inspection. 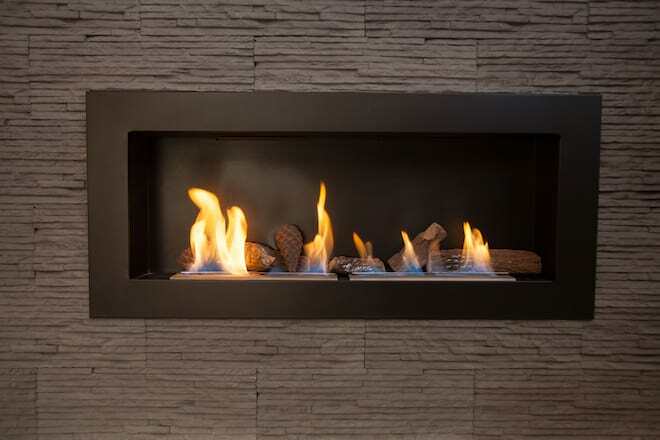 As with electric fireplaces, gas log fireplaces come in a range of heating capacities. Overall, though, they can produce more heat than electric models. This makes them a better option for large rooms, but not so great for small rooms, which they can quickly overheat. Although they burn clean and can put out intense heat, gas fireplaces don’t use fuel very efficiently. They’ll usually cost you more than a wood-burning fireplace or pellet stove for the same amount of heat. You won’t get that soothing crackle, either. Enjoying a cozy fire doesn’t have to involve hassle and mess. A gas or electric fireplace can provide instant warmth and ambiance with little in the way of maintenance or cleanup needs. A gel-fuel fireplace makes it even simpler to add a little extra heat to a room, although the need to replace the fuel cans frequently makes these models less convenient to use. A minimalist home fosters a sense of calm and comfort that has far-reaching benefits for your well being. Achieving your minimalist ideal might not be as hard as you think, either. Focus on the essentials and get creative with your storage, and you’ll soon see a relaxing, orderly space emerge from a once-cluttered mess. 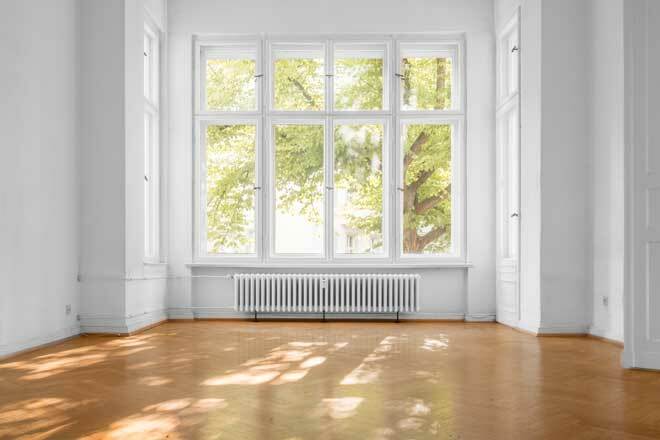 Identifying and clearing out the things you don’t need is the first step toward creating a minimalist home. Once you decide on the purpose of a room, paring down becomes a matter of getting rid of everything that doesn’t serve that purpose. If the kitchen is for cooking and eating, you don’t need old magazines and clothes in there. If the living room is for family time and catching up on work, you can put the cleaning supplies somewhere else. Start with the smallest or least cluttered room first. The sense of accomplishment you’ll get from freeing up that space will give you the motivation to tackle the bigger rooms. 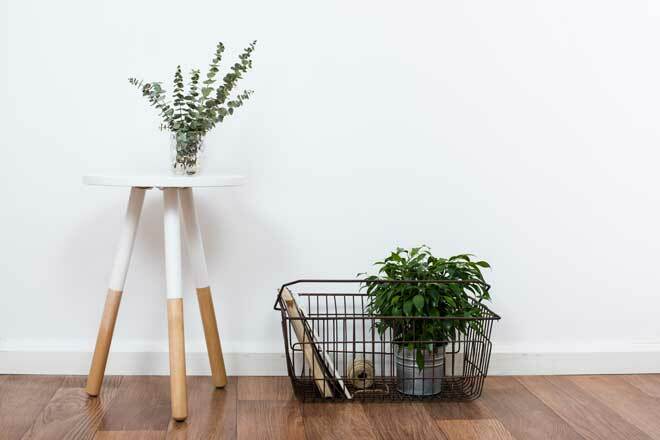 One of the most effective ways to simplify a room is to take everything out, then start putting things back one item at a time once you’ve decided you really need that item in that room. If you don’t have the time or energy to do a whole room at once, baby steps will still get the job done. Spend 15 minutes at a time going through the room item by item. 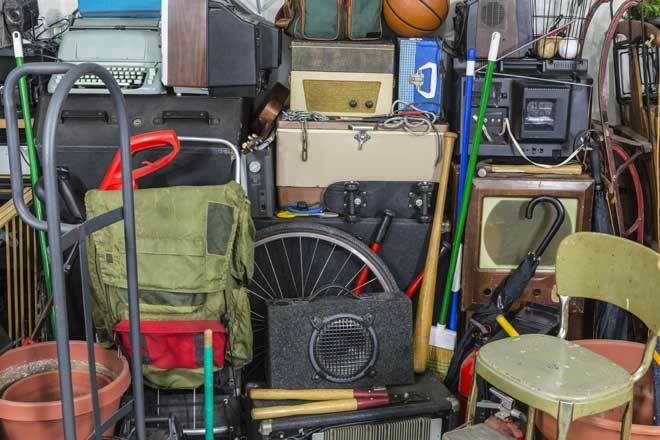 For each item, decide whether to leave it, remove it (throw it out or give it away) or relocate it to another part of the house. Cutting down on duplicate items gives you more space and ensures you get the best of everything you have. Go through your linens and keep two or three of each item per person. Keep the best, throw out the threadbare ones or turn them into rags, and give the rest away. Seasonal items can go into storage. Do the same with your tableware. Two or three plates, bowls or sets of flatware per person is usually all you need. Duplicates or similar items you don’t want to get rid of can be put on rotation. This works especially well with kids’ toys. Divide the toys into four groups for bi-weekly rotation so you can keep most in storage at any given time. With less in the room, each object becomes more prominent. High-quality furniture and decor really have a chance to shine. Each item will get more use, too, so you’ll benefit from the durability of well-made things. Whether you’re choosing what to keep or buying something new, focus on quality. Clear surfaces go a long way toward creating a minimalist look. Small storage containers keep everything you need handy without letting your stuff take over your tables. Place a sectioned wooden tray on your coffee table or kitchen table to coral pens, loose change, and other odds and ends. Put out magazine racks and wall organizers to keep papers from piling up. Use wall organizers in the kitchen to free up counter space. Once you’ve got a handle on the excess stuff in your home, it’s time to put what’s left in order and choose decor that’s in tune with your goal of simplicity and peace. Getting creative with storage lets you enjoy a minimalist home without giving up the things you’d really rather keep. Pegboard wall organizers, door organizers, rolling storage bins under the bed, cubbyhole shelving around a doorway, and many other practical storage methods can help you pack in a lot of stuff without creating clutter. Furniture with built-in storage, such as ottomans and window seats, are perfect for a minimalist home. If you really want to maximize your home’s storage potential, consider building extra storage into small, unused spaces. Maybe you can fit a set of slide-out shelves into a narrow section of wall or turn a few stair steps into drawers. By carefully organizing your storage areas, you’ll fit more in and find what you want faster. Closet organizers, drawer dividers, and all types of baskets, bins, bags, caddies, and hooks can help you keep a lot of smaller items neatly organized within a tight space. A little creativity and inspiration from the internet can work wonders here. Place an open box on its side on a shelf and you’ve added an extra layer of shelving. Think your closet is full? Make more space by using an S-hook to hang a chain from the bar, then hang clothes hangers in the links. A room without a cohesive color palette looks chaotic even when it’s not cluttered. To promote a peaceful atmosphere, stick with three main colors. Start with a neutral, such as white or grey, as the room’s dominant color. Then choose a secondary color to use for around 30 percent of the room and an accent color for the remaining 10 percent. For a little extra subtle color, bring in natural materials such as wood, metal, and stone. Potted plants help, too. The rising trends of urban living and minimalism have made versatile, space-saving furniture easy to find. Fold-out sofas, drop-wing kitchen tables, adjustable coffee tables, and standing mirrors with space for jewelry inside are a few of your options. Sometimes it’s a smart move to give away old space-hogging furniture and replace it with something more ergonomic. A simple color palette doesn’t have to mean a boring room. Adding texture gives life, dimension, and a cozy air to the plainest color schemes without overwhelming the senses. Textiles such as rugs, throws, and pillows are an easy way to bring in more texture. If you have a sleek leather sofa, soften it up with a faux sheepskin throw and some nubby knit pillows. Too many decorative items creates clutter and detracts from the beauty of each item. Take a hard look at your decor and keep only the pieces you really love. If you have more favorite pieces than space to display them, put them on rotation. To give the room a more cohesive look, choose decor that reflects the room’s accent color. Arranging your decor in odd-numbered clusters also contributes to a more organized, visually appealing look. Pay attention to your wall decor, too. A haphazard collection of pictures on one wall makes the whole room look messy. Try to pare it down to around seven to 10 pictures, depending on the size of the wall, and choose a theme to tie them together, such as similar colors or frames. Simple, monochrome window treatments do their job without creating visual clutter. Blinds and shades are usually the best bets, but if you prefer curtains, choose a light, neutral color. Consider replacing heavy drapes with blackout blinds. Even if you’re starting with piles of clutter and limited space, an inviting minimalist home is still well within your reach. With a willingness to let go of unnecessary stuff and a little creativity with your storage, you’ll quickly free up space. Once that’s done, fine-tune your color palette and decor to create an atmosphere of soothing simplicity.